+£5 MILLION more? It's a no-brainer! Love playing a 6-from-59 style lottery like the National Lottery Lotto, but want to win a jackpot with a guaranteed +£5 MILLION boost? Then try our Lotto Plus lotto jackpot betting game, now with an ADDITIONAL millionaire-making prize tier! For regulatory reasons, we can't offer you a bet on the National Lottery Lotto. Yet given how popular the 6-from-59 format is with our UK players, we thought we'd take 6 numbers from the Swiss Loto Express and offer you an alternative with a MUCH BIGGER JACKPOT! For clarity, Lotto Plus is not connected or associated with the National Lottery or the companies that run it. Furthermore, unlike the National Lottery Lotto, we do not “roll down” the jackpot prize fund after 5 rollovers, but always offer a £5m jackpot boost instead. Lotto Plus is guaranteed to always be +£5 MILLION higher than the National Lottery Lotto jackpot. It's a no-brainer, surely! Also, when you bet on Lotto Plus, you can take advantage of our incredible additional features, such as Double Your Jackpot and NumberShield. 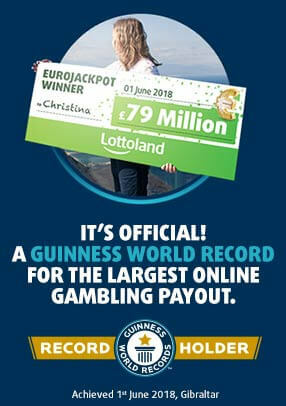 At Lottoland, it's all about getting more! Didn't have time to buy your National Lottery Lotto ticket? Not to worry - just bet on Lotto Plus instead! You can place a bet on Lotto Plus all the way up to 9:25pm. That's two hours more time to get your bet in. More cash, less dash! How do I place a bet on Lotto Plus? It couldn't be simpler! Just select 6 numbers from 1 to 59. You can also choose your numbers by selecting our QuickPick (Quick+1) option. After that, all you need to do is submit your bet.